How Many Amazon Kindle eBooks Are There In The Kindle Store? How Many Amazon Kindle eBooks Are In The Kindle Store? How Many Kindle Ebooks Are There In The Kindle Store? There are millions of Kindle ebooks! With the popularity of ebooks, the question of how many ebooks are there on Amazon has been asked many times, but as Amazon keeps such information very close to its chest, it has been a difficult question to answer definitively. However, Claude Nougat found a clever way to find the answer to this question using Amazon Associates, which you can read about in his blog post. There are in fact close to 3.4 million ebooks. Using the same method, I found that the total had increased by 20,000 only a few days after his post. I was not surprised at the number, nor with his reckoning that a new Kindle ebook is published every five minutes. With the growth in tablets, larger smartphones and of course dedicated e-readers, the demand for ebooks is increasing, as is the motivation for people to write new books in the hope of gaining sales in a new and vibrant market. What I was more interested in though, after thinking that 3.4 million was a lot of ebooks, was how many books in total there were on Amazon? I found the answer by using the same home screen search technique and was quite astonished at the number I found. That surely must be somewhere close to every single book in existence, with titles including many out of print books, but give or take a few ancient papyrus scrolls and stone carved tablets. It also says that no matter what anyone thinks, believes or tries to deny, Amazon has built a book sales and distribution empire that can, will and does control the book publishing market. Some see this as a monopoly, which by many is the definition of a bad thing. Maybe so, but it’s a fact of life now, so, it is the end of the argument. However, it is interesting to remember where and how Amazon started, way back in the nineties. Amazon was built on the back of selling book returns from the then six major publishers. These were books that had been returned because they were unsold in bookstores, and as such had no commercial value, and were destined to be pulped. It was Jeff Bezos who realised they had some value, and instead of all those hundreds of thousands of books being recycled to make cardboard packaging, he sold them online. What the big six publishers had always thought of as trash, Bezos and Amazon slowly turned into a huge goldmine. So in fact, nothing much has changed since those early days of Amazon. While the now reduced to five major publishers still look down on self-published titles as ‘trash’, similar to those 90’s ‘returns’, Amazon continues to make money from both and makes the running in the publishing market. Yes, perhaps Amazon is a monopoly, but this position of power was handed to Jeff Bezos and Amazon on a silver platter by a traditional publishing industry that was, and in some ways, still is holding onto the belief that their 19th-century business model will work in the 21st century. With 48.5 million books available on Amazon, it tells me that they may well be wrong. It hardly matters though, as it is clear, that from the biggest traditional publisher, right down to the very latest first-time self-published Kindle e-book author, they all need Amazon to sell their books. The only remarkable statistic in all this is that there are only 3.4 million ebooks in the Kindle Store. Less than a mere 10% of all the titles Amazon has on its shelves. Clearly, the ebook and self-publishing market is still very young. With the popularity of Kindle devices, Kindle apps, free Kindle ebooks, Kindle Unlimited, Prime reading, Kindle Singles, free reading apps and an ever-increasing number of Amazon Prime members, the only way forward is up for Amazon with ebooks. Even though fewer people buy a Kindle today, phone and tablet reading is increasing for customers with an Amazon account, so the sales of Kindle ebooks is continuing to grow. Note: As you can tell by reading the article above, it was first published quite some time ago. But it is still relevant in understanding how Amazon and the Kindle Store have become so omnipresent in the book market from New York Times bestsellers to one-time Indie self-publishers. The new innovation of combining audio series and Kindle ebooks is likely to be another winning move. Amazon has created an ebook walled garden. When you buy a Kindle or Fire tablet, your only choice is to buy Amazon ebooks or access Kindle book deals. By refusing to use the industry standard epub ebook file format, Amazon can control its market. Another interesting observation is that Amazon decided to close off access to the data of the total number of ebooks in the Kindle Store. It is hard to understand the reasoning behind the move unless Amazon is embarrassed about the ever increasing number, but it is now impossible to use the technique explained above in the article. However, there is another way to get an estimate. Click the related reading link below to read our more recent article explaining how to find an estimate of the total number of ebooks in the Kindle Store via Wikipedia, which states there were 6 million books in early 2018. Hearsay estimates of a new Kindle book being published every three to five minutes would seem to be entirely realistic and even on the light side of the ledger. This would equate to between 120,00 and 150,000 ebooks per year. But between 2014 and 2018, the total grew from 3 million to 6 million. This means that 750,000 books were published each year between the two dates. This equates to one new ebook entering the Kindle Store every one minute and forty-two seconds. That is certainly, a lot of ebooks. Related reading: Update – There are now over 6 million ebooks in the Kindle Store, and the number is rising by the day. Your numbers sound right, Will. But a big proportion of new Kindle ebooks are not up to standard, so they fail to gain any traction. Quality still rises, like cream, so there is still an opportunity for good authors who know how to promote their books. The problem with so many eBooks being on Amazon is that many of them are terrible…unprofessional…poorly written, and unreadable…and yet they occupy a place on the menu…so that eBook buyers have to pick their way through every title…unaware that maybe your really good read is hiding…waiting to be discovered. The amount of books on Amazon sets the odds at finding your book about the same as finding the proverbial needle in a haystack. It is discouraging. That’s why, like it or not (and I’m in the “not” camp), marketing is crucial. Very few writers excel at sales. They’re two different skill sets and personality types. I don’t have a huge budget for advertising so my options are limited. No disrespect to the writer of this article but 50 million titles, PLUS at least 5 million e-titles seems quite a low figure for all english titles. However, even with those numbers, it would take one thousand, five hundred miles of bookshelf space to display, on-end, all those books. Pity the poor reader who has to try and find your book. The Amazon site does a good job for book buyers who have a DIRECT LINK to the book they are after and effectively orders and delivers it. But it is most definitely NOT a marketing site. Just putting your book or ebook on Amazon doesn’t guarantee a single sale. For that, a new book author is going to have to invest significant time, effort and money into promoting his book, which will easily exceed the time and effort needed to research, write and edit his book in the first place. In 2018, it has now become a mammoth challenge to go from being an unknown author to a best-seller which, these days, is considered to be anyone whose one month sales exceed 5000. And they are a tiny fraction of new titles. I laughed so hard. Quick query on Wikipedia (based on UNESCO data, in case someone tried to argue Wikipedia is not a reliable source) told me that in just 127 countries surveyed there were about 2,2 million book titles published every year. Let’s assume, pessimistically, that only half of those were new titles. It still gives over a million titles per year. So Amazon would hold, at best, all titles published from about 1970. Yeah, that’s definitely close to every single book in existence. It’s a pity Amazon has taken away the possibility of checking how many Kindle ebooks there are by using Amazon Associates data. But I would guess that a million new Kindle ebooks each year wouldn’t be beyond the realms of possibility now. As soon as someone buys an ebook it’s given a ‘Paid in Kindle’ rank. Today I spotted an ebook with a ‘Paid in Kindle’ rank of #5,165,699. Believe it or not it was listed as a ‘best selling in…’ ebook. That means 5,165,698 ebooks are selling better and probably a lot more are not selling at all. 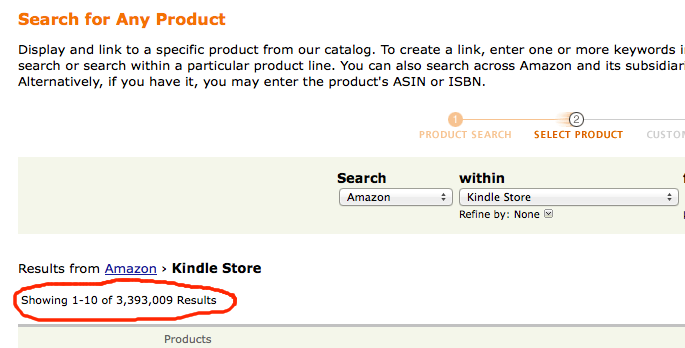 I think either your method is wrong or the ‘paid in Kindle’ is giving false results. I don’t know how had the situation today is, but several years ago the numbers of books on sale were strongly inflated by what are essentially fake books. As a result, the total number was totally meaningless. Renaming and combining old, out-of-copyright books was popular too. One could create an essentially infinite number of ‘anthologies’ and ‘best of’ books by randomly combining old short stories of popular 19th/early 20th century authors. I recall reading similar stories, Psilopa. One that I can clearly remember was an author who published over 1,000 Kindle ebooks in one year. But all are scammers and don’t last long. Readers are smarter than that.